You CAN Straighten Scoliosis in a Growing Spine Without Surgery. Scoliosis is a growth problem. As a child grows, the spine grows more twisted and crooked. It is not possible to fix scoliosis in a 2-week boot camp, with chiropractic adjustments, or by hoping it will go away. Scoliosis is a problem that must be monitored closely and treated over the course of the child’s growth, up until skeletal maturity. You will only get one chance to steer the spine straight through your child’s final growth spurt. All too often there remains only a brief period of growth when the scoliosis is first discovered. Make the right decisions and scoliosis worsening is not only stopped, but the spine can often grow significantly straighter, without the need for highly invasive surgeries. 1. Change the Shape – Structural Treatment for changing the shape of the body may be to make the spine straighter, stop scoliosis progression, or improve aesthetic issues caused by rib or spinal asymmetry. 2. Pain Control – This is treatment aimed at reducing pain and restoring lost function. This treatment type can be thought of as a Functional Treatment. When scoliosis occurs in children or adolescents, the accepted goal in medicine is to merely stop the curve from worsening beyond surgical range, usually determined to be 40 or 50 degrees. Setting a goal to merely slow down the rate at which scoliosis worsens is based on the myth that nothing can straighten the spine except surgery. 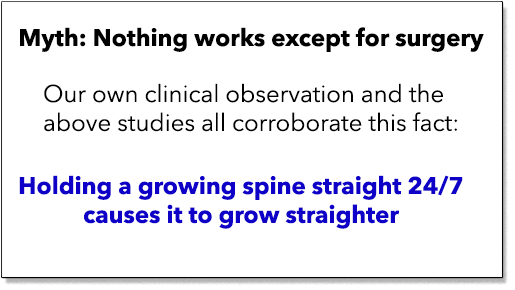 According to published literature, however, it clearly IS possible to straighten a growing spine without surgery. Therefore we propose that the primary goal in growing spine should be not only to stop curve progression but to also reduce the curvature so that the spine grows straighter. All of the following goals below are common goals for treating childhood scoliosis. a. Slowing or Stopping Progression. Be aware, that trying to merely slow progression is an uninspiring, and 19th-century goal which often leads to under-treatment, and treatment failure. b. Making it grow straighter (This is the correct goal!) The best defense is a good offense. The published medical literature is conclusive; it is possible to use growth as a corrective force in treating scoliosis. Maximizing on this opportunity is the best strategy in our experience. c. Improving the rib hump and aesthetics. In order to improve the posture, and restore symmetry to ribs and waistline, the structure of the curve must be changed. The good news is that problems like a rib hump and asymmetric waistline can often be corrected even after the end of growth and in adults. d. Improving lung capacity and heart function. Lung capacity and heart function can be hindered by larger thoracic curves. The best way to combat this is by straightening the spine and restoring symmetry to the rib cage. Of course, exercise will also play a critical role in maintaining a healthy heart and good lung capacity. It is not normal for a child with scoliosis to be experiencing pain. If they are, diagnostics should be performed to rule out other serious causes of spinal pain. However, as an adult with scoliosis, it is quite common for degeneration, vertebral slipping, and instability to occur as a result of scoliosis. These changes can lead to pain and limited function. By limited function, we mean that the ability to perform an activity may be limited because it causes pain either at the moment of the activity or a later time by inflaming the joints of the spine. For more information on reducing pain and restoring function in scoliosis, click here. When treating scoliosis in adolescents or children the goal is to alter the shape of the spine, enabling it to grow as straight as possible. Pain management and control is only a concern some of the time and will require additional diagnostic exams or tests. When treating scoliosis in adults, the main goal is typically not as much to straighten, but rather to alleviate pain. Once the body is skeletally mature, nonsurgical treatment methods become increasingly less effective in providing curve correction. While reduction can sometimes be attained, any gains come with greater effort and less return on investment. Typical structural changes that are possible in adults include postural re-centering, translational improvement, flexibility improvement, and minor Cobb angle improvement. The key to successful scoliosis management in an adult is to first understand WHY the pain is present. This may require diagnostics such as hands-on examination, weight-bearing multi-position MRI, and/or in-depth lab analysis. Treatment is focused on reducing inflammation, improving alignment and increasing the range of motion through exercises and gentle bracing when indicated. At the end of the day, most adults want to be able to do the things they love without severe pain and inflammation every time they try. Non-surgical ways of restoring lost function may include exercises like Schroth, SEAS, Palliates, Yoga for Scoliosis, Myofascial Therapy, traction, and gentle chiropractic or physical therapy treatment. 1) We already know when spines are likely to grow worse, we don’t need to “watch” or observe to see if it will. 1 Every big curve has one thing in common — They started small. 2) The Observation periods are way too infrequent. Notice how the curve in the above graphic is doubling in size each year? This is normal and reflective of how quickly scoliosis can worsen within a year’s time. For this reason, we believe the correct frequency of observation (imaging the spine) should be every 3 months during growth spurts. Since this frequency of imaging would likely result in too much radiation exposure, we have replaced the X-rays with standing, radiation-free MRI. 3) A once-in-a-lifetime opportunity is lost. A child only grows up once. The smaller the scoliosis, the younger the age, the more correctible it is. 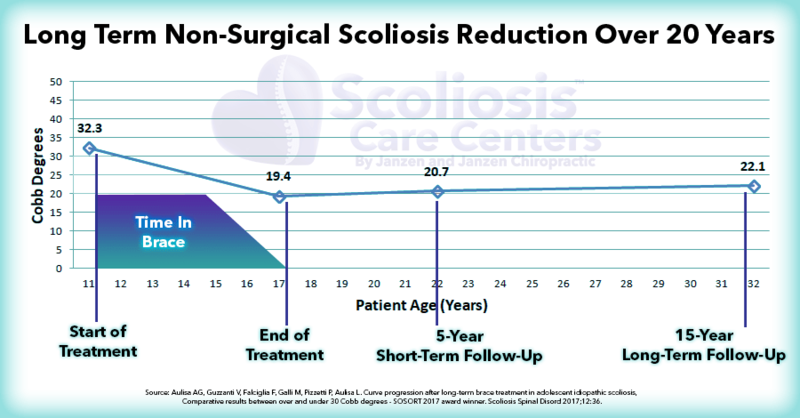 Scoliosis Care Centers has a 100% success rate in avoiding surgical progression when treatment is begun at 25 degrees or less. By merely “observing” a 25-degree curve, an opportunity is lost to provide a treatment with a 100% success rate. Hopefully, it is clear by now that observation only in growing spines over 25 degrees is a bad idea. However, this is not to say observation isn’t an important part of treatment. In curves that are between 7 and 20 degrees, sometimes there can be uncertainty as to whether or not a true scoliosis curve exists. In such cases, close observation may be an acceptable course of action. For example, a child with a 12-degree c-curve may have just been standing funny, or have a slight curve that will never progress. By following up with an image in 3 months to see if it is changing, it can be determined if there is a true problem. Even in the case above, however, waiting 1 year could allow an unacceptable amount of progression of the 12-degree curve. This could result in the curve doubling in size. So if observation only is being used, it should only be used for curves under 20 degrees, and the observation frequency should be every 3 months, not one year. Another major problem with observation is that a full spine X-ray is required to measure the status of the scoliosis. Because an X-ray is a harmful form of ionizing radiation, which leads to higher rates of cancer in those who have had scoliosis X-rays, doctors have developed protocols which are aimed at reducing the number of X-rays used in managing scoliosis. The problem with this is that there is pressure to NOT look at the spine, and too much time in-between images allows unexpected worsening of scoliosis. This problem has a simple solution. Use Standing MRI instead of X-ray to monitor or “observe” the changes in scoliosis. You can jump to our section here on how Standing MRI can be used to screen for scoliosis, monitor a curve once it has been discovered, and guide scoliosis treatment to help provide the best treatment possible. How Standing MRI Helps Solve the Observation Problem. 1) The risk of cancer from ionizing radiation is eliminated. 2) Observation frequency can be increased from once a year to once a quarter (every 3 months) or more. This allows a much closer watch on the progress of the curve. Frequent observation is critical, for as you will see below, curves can double in size over a one year period. 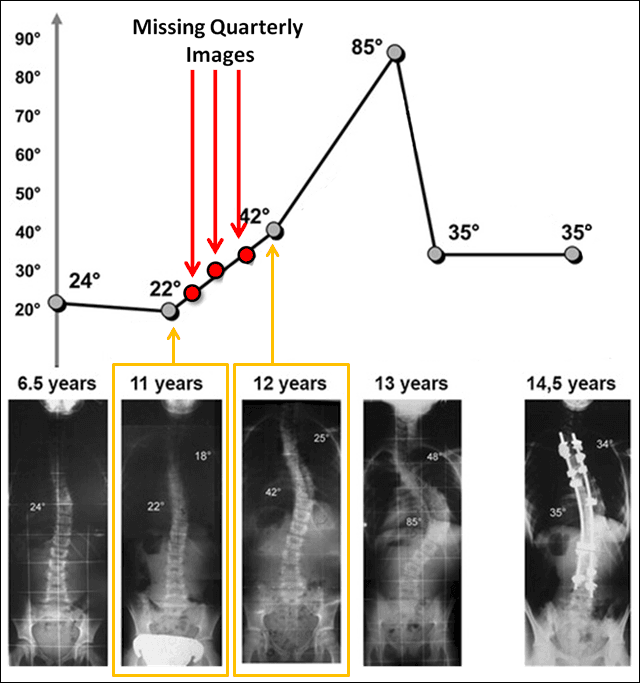 This kind of exponential worsening during the adolescent growth spurt is commonplace in scoliosis and is to blame for all too many scoliosis surgeries. 3) Treatment quality can be guided using a standing MRI. When prescribing braces and exercises, the alignment in the brace and the effect of the exercise can be measured with MRI. 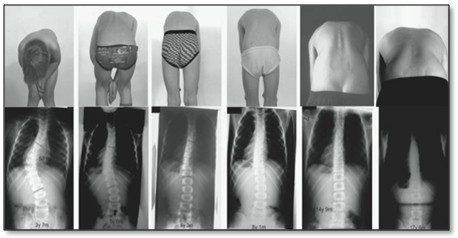 Scoliosis can worsen rapidly as the child’s rate of growth increases, doubling in size or worse during a growth spurt. The tendency in medicine is to not watch these curves closely enough because X-rays must be used, and there is a belief in the myth that nothing will help other than surgery. These problems are easily solved through the use of standing MRI. Observation should never be used as a treatment alone in curves over 25 degrees. Instead, curves should be treated when they are small, since treating curves 25 degrees and under has a 100% success rate for avoiding surgery at our clinic. What this treatment looks like will be explored in the subsequent sections. In order to assure that your case of scoliosis grows straighter, there are 5 key problems that must be solved. Solve these 5 key problems, and virtually every scoliosis spine will grow straighter! Now we realize that this sounds too good to be true, we hear this often enough from parents, and you will likely hear it from the orthopedic surgeon. The truth is, however, that for kids with scoliosis less than 40 degrees, following these 5 steps is currently resulting in a 98% success rate for avoiding surgery in our clinic. Don’t Do Nothing: Observation ONLY in Growing Curves Over 25 degrees is NOT a Treatment, It is Neglect! The alignment problem is simply this: A spine will grow into the shape that it is held. Think of the young tree trunk; a sapling will grow into whatever shape it is held. The spine is no different. If a spine is being held into a coiled down scoliotic position during growth, then it will solidify into that shape as an adult. Just like a sapling, for a spine to grow straight, it must be held straight 24/7. Only a brace can attain this feat for kids with scoliosis. Both clinical experience and published medical literature agree: Bracing can not only help a spine avoid progression, but also help it grow straighter. Some of the more outstanding studies on this matter include Mehta’s “Growth as a Corrective Force”, Weinstein’s BRAIST study in 2013, and the Aulisa study in 2017. There was a failure to address the root cause of the problem. Whatever the case may be, most orthopedic surgeons see only bracing failures, not successes. This continually reinforces their belief in the myth that nothing works except surgery, even undermining the will to try. Below is an example of an actual patient of ours, with actual scoliosis, that was just about as crooked in-brace as she was out of it. Weak, poorly designed and poorly fit braces (which patients don’t wear) are to blame for most of the opinion that braces don’t work. 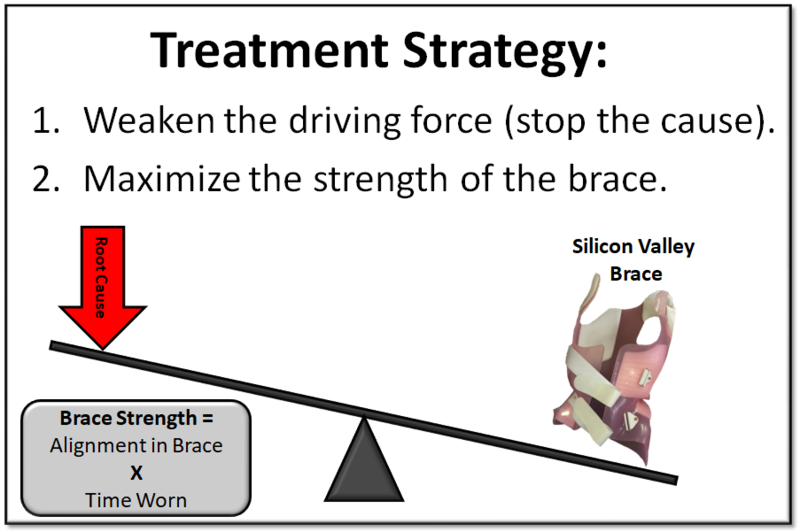 Here is the same patient as above, notice how the Boston brace barely makes a dent, versus the highly-corrective Silicon Valley Brace Method. There is another myth commonly believed in today’s scoliosis care. The myth deals with what causes scoliosis. If a child has no congenital anomalies, no obvious genetic syndromes, and no neuromuscular diseases, then their case is categorized as “idiopathic scoliosis”. The myth here is that there is no known cause for idiopathic scoliosis, or that the cause cannot be known. This is a critical point: What in the world is causing the spine to want to coil down into a larger and larger curve as the child grows? Can this mystery force be identified, and can anything be done about it? There’s another dirty little secret that all the surgeons know: The spinal cord is almost always tight in childhood idiopathic scoliosis. In surgery the tight spinal cord presents a significant problem, that is if the surgeons accidentally over-straighten the spine and make the spine too tall for the tight cord, paralysis may result. This is the main reason that spinal cord monitoring is a routine practice today with scoliosis surgery. The tight spinal cord is also the number one reason that surgeons can’t make the spine perfectly straight when performing a scoliosis fusion surgery. There is no debating the existence of the short spinal cord problem. What is debated is the chicken-or-egg question: Which came first, the tight spinal cord or the scoliosis? And which one causes which? Strangely, most doctors do not find much interest in the question of the Root Cause, or the tight spinal cord as a probable root cause for most idiopathic scoliosis. But think about it: If a tight spinal cord can prevent a surgeon from being able to straighten scoliosis, how much more will the tight cord hinder progress when depending on a non-surgical approach? We believe that if you can stop the driving force causing scoliosis, we should see better treatment outcomes. It was with this confidence that we set out to solve the problem of the tight spinal cord, and began inventing ways to treat the problem non-surgically. Today in our centers, testing for and treating nerve tension is a routine part of our scoliosis care program. We have found that it is possible to quantify nerve tension, treat it, and resolve it. Relieving the spine of the nerve tension that causes scoliosis is a pretty big deal. This means that the driving force causing scoliosis now may be reduced or eliminated in many cases. This ability has been a key ingredient in our treatment formula and has lead to a satisfying 100% success rate in avoiding surgery for cases under 25 degrees. 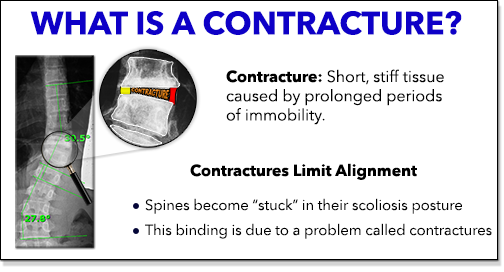 Understanding what contractures are will be very important to your non-surgical scoliosis treatment journey. 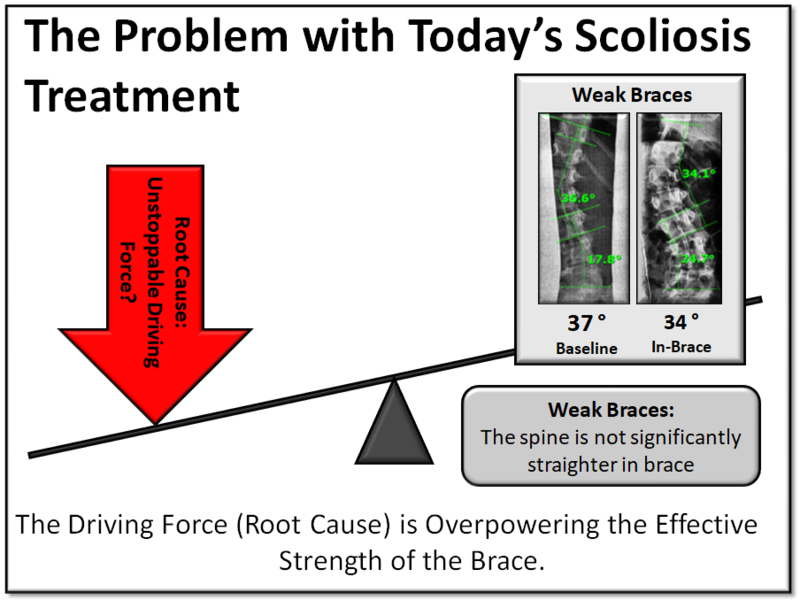 Here at Scoliosis Care Centers, we are achieving unprecedented in-brace alignment. How are we doing this? There are a few key problems that must be addressed in order to make such a revolutionary brace. One of the main problems that must be solved first is that of contractures. What are contractures? Contractures are what cause the spine to become “stuck” into a structurally stiff scoliosis, one which is no longer able to move back into a straight alignment. When the joints of the spine are continually held in a deformed position, they are no longer able to exercise their normal range of motion. This lack of ability to move normally leads to ligaments and muscles growing short on the concave side and long on the convex side. Contractures are one of the largest obstacles to a scoliosis being able to return to a normal alignment. Surgeons know this, and in scoliosis surgery, it is routine to simply “release” the contractures by cutting away all the contractured tissue which is binding the spine into a coiled-down scoliotic posture. Contractures can also be treated non-surgically, and when they occur in elbows or knees it is common for therapists to use a stretching device to stretch and release the contractures. For the spine, however, no such tool existed for the 3-dimensional contractures of the scoliotic spine, so we invented one. We call our device for treating contractures in scoliosis the “Scoliosis Flexibility Trainer”, and its sole purpose is to release the contractures of scoliosis, allowing the spine to more freely return to straight alignment. By first treating the contractures, it becomes possible to make a brace that will be much more corrective. This is a key part of our process for bracing growing spines at Scoliosis Care Centers. V. Solving Strength and Conditioning Problem(s) Through Scoliosis-Specific Exercises. • Core Spinal Muscle Weakness and imbalance. • Reduced lung capacity and function. Exercises aimed at the correction of scoliosis or scoliosis-related problems are referred to as scoliosis specific corrective exercises. Not all exercises are beneficial for scoliosis. Going to the gym and doing sit-ups, will not help improve the alignment. Here we cover scoliosis specific exercise approaches and discuss our experience with the use of each of them. Schroth physiotherapy is one of the most tested methods of scoliosis exercises and treatment in existence. It was invented nearly 100 years ago by Katharina Schroth, a physical therapist in Germany. Schroth combines controlled breathing and body posture to help direct the spine back toward its intended straight position. It can be helpful in the management of both childhood and adult scoliosis. Of all the discussed exercises, the Schroth method places the heaviest emphasis on breathing exercises and the restoration of lung capacity. However, it should not be relied upon without a brace if the patient has a growing spine. A downside to Schroth therapy is that it is very complicated to administer, and some patients find it just plain boring. If the exercises are done incorrectly, it can worsen the curve angle or just be ineffective. Thus, Schroth exercises are often practiced under the guidance of a trained practitioner. The Scientific Exercise Approach to Scoliosis is an exercise method for scoliosis derived in Italy. SEAS is a more simplified version of scoliosis-specific exercises. These exercises still need to be taught to patients by a trained practitioner. The +advantage to SEAS is its simplicity and its ability to be incorporated into one’s daily posture. Lastly, like Schroth, these exercises should not be relied on exclusively for growing spines and/or scoliotic spines above 25 degrees. Weighted Device Exercises, also known as Spinal Weighting, is a scoliosis exercise that is practiced among CLEAR, ScoliSmart, Pettibon and Chiropractic Biophysics scoliosis treatment providers. These exercises are designed to train the postural muscles in the back to hold the spine into a straighter posture. In our own clinical experience, we have found this style of exercise to be very useful, and have developed an entire array of our own 3-dimensional weighted device exercises. Like all of the exercise methods mentioned before, spinal weighting should not be relied on as a standalone exercise for treating scoliosis curves over 25 degrees in a growing spine. Can a SAS suit Substitute for a Brace? A Scoliosis Activity Suit is somewhat of a cross between a scoliosis exercise and a soft brace. It is designed to be worn 30 minutes or so while performing daily activities or exercises. It is designed to challenge the rotation and alignment of the scoliosis so as to activate muscles that should help correct the curve. This treatment method is relatively new, thus there is little literature that supports if this effective. While it is sometimes referred to as a brace, it should not be mistaken as one in terms of providing correction. Like all the methods motioned prior, the activity suit should not be used as a replacement for a brace in growing spines that have curves over 25 degrees. 1) Weaken the Root Cause – Weaken or eliminate the driving force causing the spine to coil down, which is usually a tight spinal cord. 2) Maximize Brace Effectiveness – Make the spine as straight as possible or even hyper-corrected in a brace, and hold it there 24/7. It is this basic philosophy which is the foundation of the Silicon Valley Scoliosis Treatment Method. The method was birthed out of a relentless search for a solution that would provide the most improvement possible for children and adolescents with scoliosis. It is simply not okay for even one child to worsen to the point of surgery, and the SV Scoliosis Method aims to end scoliosis surgery by providing a truly effective non-surgical intervention. 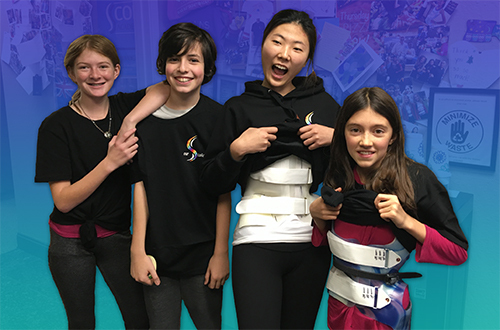 It makes use of innovative scoliosis treatment equipment invented by Scoliosis Care Centers, including their own hyper-corrected custom brace for each child. For more information on this method and what defines it, click here. In a growing spine, all one has to do to see predictable success is hold the spine straight 24/7, and eliminate the root cause of the problem. In order to get the spine straight, contractures must be released, and the spinal cord must be elastic enough to allow this. To guard against muscle atrophy and loss of lung capacity, exercises should be used daily. Close observation of the progress of scoliosis can be safely attained using standing MRI. How Well is Your Scoliosis Treatment Plan Addressing All 5 of These Problems? b. Is the imaging technique free of ionizing radiation? c. Is more being done than merely observing if the curve is over 25 degrees? b. Is the spine being held straighter in a brace 24/7, or just part-time? a. Are contractures limiting your alignment in-brace? b. What is being done to address the contracture problem? a. Is the tight spinal cord being actively addressed? b. Are neuromuscular imbalances being addressed? c. Has a full spine MRI been performed to rule out other possible causes of scoliosis? a. Are exercises assigned to help the core muscles? b. Do the exercises help correct the curve? c. Are exercises being used that target heart and lung function? Is the Spine actually growing straighter? Nachemson AL, Peterson LE. 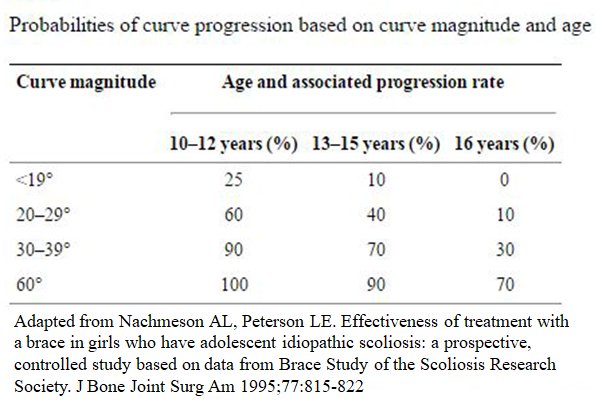 Effectiveness of treatment with a brace in girls who have adolescent idiopathic scoliosis. A prospective, controlled study based on data from the Brace Study of the Scoliosis Research Society. J Bone Joint Surg Am 1995;77:815–22. Mehta MH. Growth as a corrective force in the early treatment of progressive infantile scoliosis. J Bone Joint Surg Br 2005;87:1237–47. Aulisa AG, Guzzanti V, Falciglia F, Galli M, Pizzetti P, Aulisa L. Curve progression after long-term brace treatment in adolescent idiopathic scoliosis, Comparative results between over and under 30 Cobb degrees – SOSORT 2017 award winner. Scoliosis Spinal Disord 2017;12:36. Roth M. Idiopathic scoliosis caused by a short spinal cord. Acta Radiol Diagn (Stockh) 1968;7:257–71. Roth M. Neurovertebral and Osteoneural Growth Relations, A concept of normal and pathological development of the skeleton. Univerzita J.E. Purkyne, Brno: Radiodiagnositic Clinic, Medical Faculty, 1985. 101 p.
Roth M. Morphology and development of the spine: Plea for a doubt. Rivista di Neuroradiologia 1998;11:313–20. Roth M. Idiopathic scoliosis from the point of view of the neuroradiologist. Neuroradiology 1981;21:133–8. Burwell RG, Clark EM, Dangerfield PH, Moulton A. Adolescent idiopathic scoliosis (AIS): a multifactorial cascade concept for pathogenesis and embryonic origin. Scoliosis Spinal Disord 2016;11:8.